American history teachers get the tools they need to teach students to use academic vocabulary and language to read, write, and think like historians. In this new practical professional resource, middle and secondary level American history teachers see how to engage in history in order to ignite student debates over topics or issues; read, write and think like historians to help students organize the domain-specific vocabulary words into ways that make sense; use general academic vocabulary and language to help students explore and learn about the past; and tap into the powerful roots of English to become equipped with the tools to help students become independent word learners for the rest of their lives. After setting the stage for teaching vocabulary in history, 12 independent American history units cover the four stages in domain-specific vocabulary instruction and related core activities and strategies, including building background knowledge, thinking like a historian, connecting vocabulary in context, and assessing vocabulary knowledge. The units parallel eras in American history and the related chapters generally found in American history textbooks. They provide flexibility for use as the teacher sees fit, with an eye to students’ needs and instructional objectives. Three helpful appendices include a look at the big picture graphic organizers customized for teach of the 12 units, three generative vocabulary assessments, and history teachers’ favorite go-to generic graphic organizers and ready-to-use blank templates. Immediately engage with history at the beginning of each unit of study through motivating introductory activities such as “taking a stand,” which ignites student debates over contentious topics or issues. Students connect history to their own life experiences. These “big pictures” can be presented to students as advance organizers at the very beginning of the unit so they can see where they are going, as a “one-stop shopping” place for students to take all notes from class discussions and reading during the unit, and as a highly effective review tool and study guide at the end of the unit. Incorporate academic vocabulary into content reading, writing, and learning through the use of core activities, such as signal vocabulary banks and text frames. Students get multiple opportunities to effectively use words as tools for reading, writing, thinking, and discussing complex and important ideas. Included for every unit, this instructional integration saves valuable instructional time and makes good pedagogical sense. Teach using material that matches directly with the curriculum through 12 American history units that parallel eras in American history and the related chapters usually found in American history textbooks (Volume 1 covers “The World Before 1600” to “American Imperialism 1890-1920”). This resource fits seamlessly with the typical American history curriculum. Get invaluable help for teaching domain-specific vocabulary. Each unit follows a 4-step process for teaching domain-specific vocabulary: 1) building background knowledge, 2) thinking like a historian, 3) connecting vocabulary in context, and 4) assessing vocabulary knowledge. 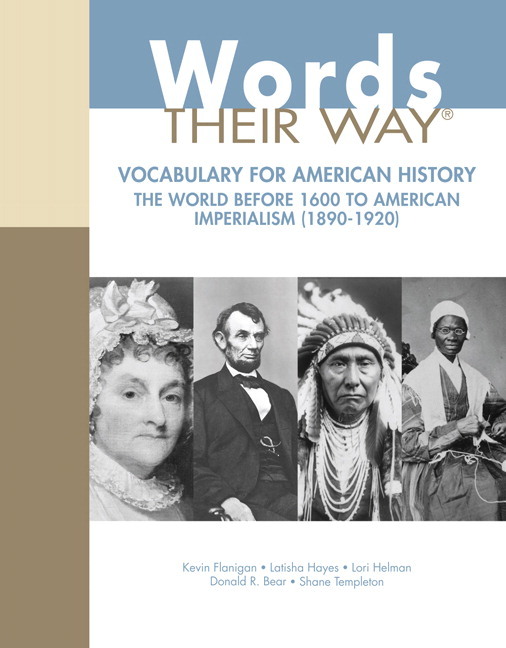 Teachers get a structured approach for teaching American history vocabulary and concepts, with the flexibility to choose activities and steps based on instructional time, objectives, and student strengths and needs. Save additional invaluable instructional time with the writing-focused vocabulary assessments included at the end of each unit. Every unit provides opportunities for assessing vocabulary, writing, and content knowledge in one place. This section taps into the powerful roots of English, including high-utility Latin and Greek roots and affixes found in the domain-specific words that you already teach, so your students are equipped with the tools to become independent word learners for their rest of their lives. Pre-, mid-, and post-year assessments of students’ knowledge of Latin and Greek affixes and roots are included in the appendices. Put additional practical help to use immediately in the classroom. The appendices include ready-to-use, blank templates of history teachers’ favorite “go-to” graphic organizers and vocabulary banks. Many of these blank templates are customized specifically for each unit of study. Kevin Flanigan is a professor in the Literacy Department at West Chester University of Pennsylvania. He works in the WCU Reading Center, where he and master’s students work with children who struggle to read and write. A former middle grades classroom teacher and reading specialist/coach, he researches and writes about developmental word knowledge and students who struggle with literacy and works with schools to implement effective literacy instruction. Kevin has authored or co-authored articles in The Reading Teacher, The Journal of Adolescent and Adult Literacy, and the Journal of Literacy Research, and is lead author of Words Their Way With Struggling Readers: Word Study for Reading, Vocabulary, and Spelling Instruction, Grades 4 — 12, and co-author of Vocabulary Their Way (2nd edition), and Developing Word Recognition. Latisha Hayes has taught students with reading disabilities in the primary through middle grades as a special educator and reading specialist. Now a clinical assistant professor at the University of Virginia, she teaches courses on the diagnosis of and intervention for reading difficulties. She works with preservice and inservice teachers at the McGuffey Reading Center, where students across the grades receive diagnostic and tutoring services. Latisha’s interests have focused on the support of struggling readers through university-based programs and partnerships. Her work has been published in Reading Research Quarterly, Literacy Research and Instruction, Communication Disorders Quarterly, and the Handbook of Reading Disability Research; she is co-author of Words Their Way with Struggling Readers, 4-12, Vocabulary Their Way (2nd edition), and lead author of Developing Word Recognition (2014, Guilford Press) with Kevin Flanigan. Lori Helman is Associate Professor at the University of Minnesota in the Department of Curriculum and Instruction, and Director of the Minnesota Center for Reading Research. She specializes in literacy education and teacher leadership. Formerly a bilingual classroom teacher for 16 years, Lori was also a coordinator of beginning teacher development and literacy coordinator of her school district. She has expertise in working with students from culturally and linguistically diverse backgrounds, and is bilingual in Spanish. Her research focuses on students’ language and literacy development, including students who are learning English as a new language. She has a deep knowledge of the theory and practical application of vocabulary and word study. Lori is co-author of Vocabulary Their Way, 2nd Edition and lead author of Words Their Way with English Learners: Word Study for Phonics, Vocabulary, and Spelling Instruction as well as other books in the series that help teachers build on the resources of multilingual students. She has also published texts and articles on various aspects of literacy development and instruction, and their applications to diverse learners and teacher education. Donald R. Bear is a professor in literacy education at Iowa State University where he teaches doctoral, master’s, and preservice teachers, and directs the Duffelmeyer Reading Clinic. He is also professor emeritus from the University of Nevada, Reno. Donald is involved in studies that examine literacy learning, particularly studies of orthographic development in different and second languages. His research explores the specific sequence students follow across the synchrony of literacy learning from beginning concept of word in prekindergarten to how morphology underlies academic vocabulary learning. He is an author and co-author of numerous articles, book chapters, and 12 books, including Words Their Way, 6th edition, Vocabulary Their Way (2nd edition), Words Their Way with English Learners, and Words Their Way with Struggling Readers, 4 — 12. He is an author on several instructional programs used throughout the United States. Donald is also involved in innovative professional development grants, and his work in assessment and word study is used widely. He has received several awards for teaching and service, and is currently a board member of the International Reading Association. Shane Templeton is Foundation Professor Emeritus of Literacy Studies at the University of Nevada, Reno. A former classroom teacher at the primary and secondary levels, his research has focused on developmental word knowledge in elementary, middle, and high school students, exploring primarily the relationships between spelling, morphology, and vocabulary. He is widely published in a number of research and practitioner journals, and is author and co-author of several books including Vocabulary Their Way; Word Study with Middle and Secondary Students; Words Their Way with Struggling Readers, 4-12; and, with Kristin Gehsmann, Teaching Reading and Writing: The Developmental Approach. With Darrell Morris, he co-authored the chapter on “Spelling” in the Handbook of Reading Research, Volume 3; he is author of the entry on “Spelling Instruction” in the Encyclopedia of Education (2nd ed., 2003), and the chapters on Spelling in the Handbook of Research on Teaching the English Language Arts (2nd ed, 2003; 3rd ed., 2011). Since 1987, Shane has been a member of the Usage Panel of the American Heritage Dictionary. Jeff Anderson has spent his adult life focused on the goal of serving others, whether that is teaching his students how to be responsible, engaged citizens, or shaping public policy. Jeff has taught Social Studies in the Austin, MN School District for 24 years. In that time he has taught almost anything and everything in the Social Studies curriculum. Jeff’s background is US History and Political Science. In addition to teaching, Jeff served in the Minnesota House of Representatives in the early 2000’s and has served on the Minnesota Board of Teaching. He is currently working on his Masters in Political Science.